Department of Information Technology of Shah and Anchor Kutchhi Engineering College was organized AICTE-ISTE approved one week Short Term Training Program on “Recent Trends in IOT” during 2nd Jan 2019 to 7th Jan 2019. Inaugural ceremony started at 09:30 AM at 4th floor auditorium on 2nd January 2019 in presence of Keynote Speaker Dr. Deven Shah, BOS Chairman, IT Department, Mumbai University, Principal of SAKEC Dr. Bhavesh Patel, Vice Principal of SAKEC Dr. V. C. Kotak, IT HOD Ms Swati Nadkarni, staff and participants.STTP covers the topics:- 1) Arduino/ Node MCU Introduction, 2) Arduino IDE- Small project,3) Sensor and connectivity, 4)Circuit diagrams with tools, 5)Network, Communication Protocol, 6) Cloud Connectivity, 7) Introduction to Raspberry Pi, Setting up Raspberry Pi, 8) Programming with Pi,9) Security concepts in IOT,10) Hands on IOT security which was taken by Ms. Poornima Mahesh, Ms. Archana Chaugule, Mr. Manish Bhelande, Mr. Shivraj Dongave, Mr.ShriniwasYalampati, Mr. Yogesh Pingale, Ms. Smita Bansod, Mr. Saurabh Patil, and Mr. Chetan Mahajan. 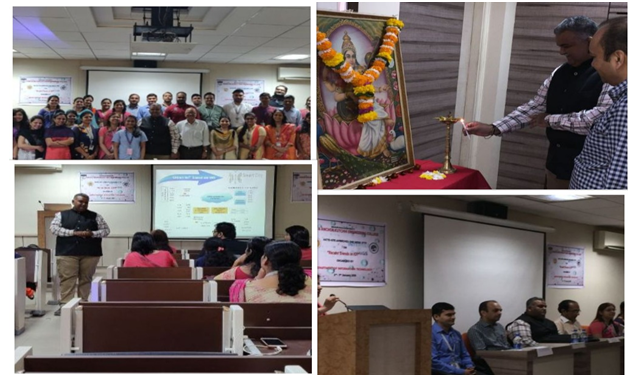 Department of Information Technology of SAKEC ,organized AICTE-ISTE approved one week short term training program on “Web & Mobile Application Development” from 4th to 10th January, 2018.The STTP was inaugurated in the 4th floor auditorium by Chief Guest –Speaker Mr.Nilesh Vidhate from Cyber Indigo Net Pvt. Ltd., Dr. Bhavesh Patel, Dr. V. C. Kotak, Prof Swati Nadkarni . The keynote speech was delivered by Mr.Paresh Shah CEO (Allied Digital). The Course content lectures were delivered by eminent speakers from various reputed institutes. 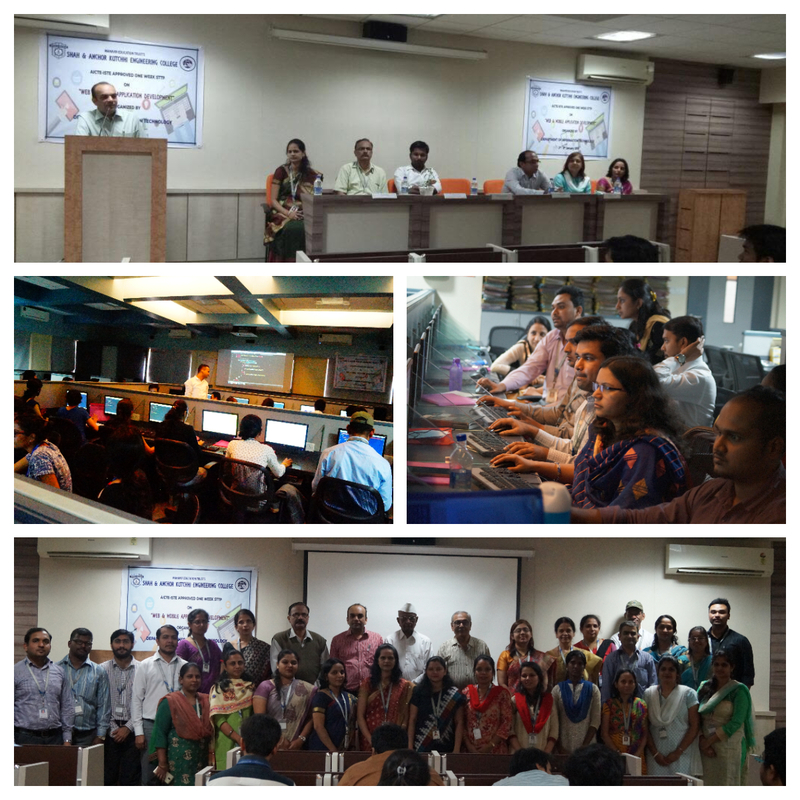 Information Technology Department has organized one week STTP on Open Source Tools with Hands on Lab from 14th December to 19th December 2015. Objective of the Short Term Training Programme was to Use software Tools in Various domains of Engineering,to Learn about different Categories of Open Source Tools ,To Demonstrate the working of open source tools .The Course content lectures were delivered by eminent speakers from various reputed institutes like TIFR,SPIT,TSEC.